Congratulations to Perla de Castillo! Our 2017 CFL SWE/FEF $1000 Scholarship winner! Perla is a junior at the University of Central Florida and is studying Computer Engineering with a minor in Technological Entrepreneurship. At the WE16 National Conference, our section won the Membership Retention Award. Congratulations everyone! Our 2016 CFL SWE/FEF $1000 Scholarship winner! Taiason is a sophomore at the University of Central Florida and is studying Aerospace Engineering with a minor in Business. Our section won three awards this year at the 2015 Region D Conference. These awards included the Membership Retention, Membership Recruitment, and Communications Awards. Thank you to our great officers who helped contribute to the applications for these awards. Congratulations everyone! This year we have two members applying for the Society Emerging Leader Award. Please join me in wishing luck to Tina Haley and Carolyn Bonaventura. If you are interested in applying for an Individual Award next year please email Tara Lamoureux at cflsweawards@swe.org. Congratulations to Marlene Hyde and Migdalia Hernandez! Two members from the Central Florida Section won E-Week Awards this year. 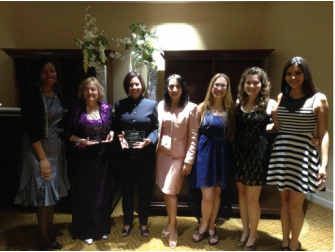 Please join me in congratulating Marlene Hyde for winning the Lifetime Achievement Award and Migdalia Hernandez for winning the Leadership Excellence Award! If you are interested applying for an E-Week Award next year please contact the Awards Chair. Chelsea Dickens is the 2014 recipient of the CFL SWE scholarship. Congratulations Chelsea! Maria Maldonado is the 2014 recipient of the CFL SWE scholarship. Congratulations Maria! 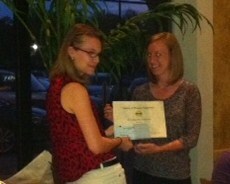 Information: Won the award for Emerging Leader at the Central Florida Engineers Week Banquet, nominated by the Section. This is a prestigious award going to those leaders in engineering who has between 10 and 20 years experience and who have worked in management to enhance the engineering profession and contributed to the good of the public through their leadership. Allsison Won the award for Young Engineer of the Year at the Central Florida Engineers Week Banquet nominated by the Section. This honor is given to an engineer is 35 years old or younger with 10 or less years experience, and who have contributed to the engineering profession through their technical achievement and outreach. The results have been tallied for the FY14 national SWE leadership. Information can be found here. Join us in congratulating these women for their accomplishment.